Bitcoin has a very dynamic growth, spreading in all directions which hold true for its prices, interest amongst people, usage and so on, however the number of BTC Hackers, spies, and thieves too has seen an upsurge. That’s what this BitMix review should help you with. Because Bitcoin is a digital currency, it’s much easier to trace and steal as compared to fiats lest the necessary precautions have been ignored, mixing Bitcoin is one such precaution. I said Bitcoin is easier to trace, but wasn’t it supposed to be anonymous? Well, it is but not the way it’s generally presumed to be. Bitcoin transactions can’t be linked back to the “owners” of the funds as long as the owners didn’t use any personal Identity proof while purchasing their coins as Bitcoin wallets can be created anonymously. However, the amount of funds sent, the sender’s and the receiver’s BTC address along with any BTC address’ net worth can still be publicly and easily verified for every single BTC transaction. That’s where Bitcoin Mixing comes to the aid, it’s a process by which users can de-link their transactions, so you can send funds from one wallet to another without leaving a trail to trace or just de-link the original purchase of the coins from the later spends. As you can see, users send their coins to a Mixer, the mixer keeps the user’s coins, and sends coins from its own reserve to the user’s receiving address, hence there’s no link between the coins sent by the user and the ones received by him/her which can then be used for any and all purposes without being linked back to the user’s purchase of the initial coins. Is Registration Required at BitMix? No, Bitmix is a completely anonymous platform and hence doesn’t require registration or any other personal details such as names, Identity proofs or anything which can be linked back to your real life identity. How Easy or Hard is it using BitMix? Throughout this section, I bring to light the user-interfaces of the mixers being reviewed. The easier and simpler it is, the better it’s considered to be. This is what welcomes users as soon as they land on the homepage, it’s noteworthy that the homepage is the mixing page as well and no further clicks or navigations needed to get to the mixer. 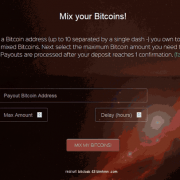 As is evident, even though you’ve never before used a Bitcoin mixer the steps to use this one are almost self-explanatory and can be understood by just about anyone. 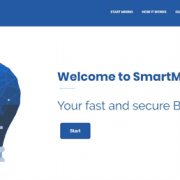 It simply asks for a Bitcoin deposit address where the user wishes to receive his/her clean funds, followed by a pretty well-placed “Add Address” button for additional addresses and then two sliders for time-delays and service fee! So as far as user-interface goes I’d rate it a 5/5 for the purposes of this BitMix review, let’s take a glance at the other features the mixer has to offer. How many Additional Addresses does Bitmix support? The number of Additional addresses any mixer supports are the number of extra addresses, in addition to your primary output address where your funds can be sent to. The total funds are split into many different parts (depending on the number of additional addresses chosen) and hence the input amount (unclean coins) and the output amount (clean coins) to each address vary widely. More addresses greatly increase the hardship for hackers to hack or steal your coins. As for Bitmix it supports 5 additional addresses, this number isn’t that great when compared to most other mixers with similar features which go on to offer a minimum of 10, or even 20 at times. But then again, 5 too is an acceptable number as far as anonymity factors are concerned. Does BitMix Allow Time-Delays? Are they User-controlled? Time-Delays are simply the amount of time the mixer waits before sending users their clean coins. The longer the wait is, the harder it’ll be to link the input of unclean coins to this delayed output of clean coins. On the contrary, if the mixer sends out the clean coins as soon as it receives the unclean funds; because both the transactions would be quite close to one another they may raise red flags for hackers or whoever’s watching. Well, the answer to the above question is, yes BitMix does allow Time-delays. As shown in the above screenshot the delays are controlled using sliders, the maximum delay users can opt for is 24 hours which is at par with other mixers in the industry. The second part of the question was-user control. It denotes the amount of control users get over the time-delays, well BitMix offers partial user-control over the delays, it does let users control one single delay, which is like the starting-point before which no funds are sent out. But users don’t get to choose the later delays, or delays for individual addresses. They simply have two options- “randomize delay and fee”, “do not randomize fee and delay”, based on the choice, if the former is selected all the funds are sent out at random time intervals to each address. While if the latter is selected, once the initial time-delay is reached (X no. of hours) all the funds to all the addresses are sent out at once. Does BitMix provide Distribution Control? When adding additional addresses, it’s clear that the total funds will be split up into many different parts, but which address receives exactly how much amount is what distribution is, and being able to control that amount or percentage is what’s Distribution control. Unfortunately, BitMix doesn’t provide any control, not in the least over distribution of the funds to your individual addresses. Hence users only get to specify the output addresses, which address receives what % of their total funds is totally random (mostly split equally for all addresses). What are the Minimum and Maximum Deposit limits at BitMix? The minimum deposit limits matter in this BitMix review because any Bitcoin mixer which has a high minimum limit won’t be suitable for the average Bitcoin holder, the maximum limit however matters only if you’re mixing in bulk, or are a millionaire. The minimum deposit limit on BitMix is 0.005BTC which I must say is lower than most other similar mixers who have set their limits at 0.001BTC, hence BitMix has a clear win here. The maximum limit however is limited at 988.73Bitcoins, this probably is their total Bitcoin reserve, amounts larger than this aren’t sent out. Even though there are other mixers with maximum limit in the thousands, it doesn’t really matter because most of you folks reading this aren’t probably mixing half a million dollars anyway. 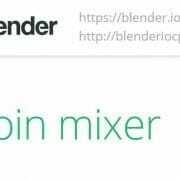 This is without doubt the single most important factor when it comes to any Bitcoin mixer review, the same holds true for this Bitmix review as well. The sole reason someone uses a Bitcoin mixer is for anonymity and privacy, hence if a mixer stores log there’s no privacy there whatsoever. Fortunately, BitMix has a strict no logs policy and its retention period too is just 24 hours, meaning all logs whatsoever are completely deleted 24 hours after a successful transaction. The retention period is the shortest possible and is important for support on queries related to the transactions. 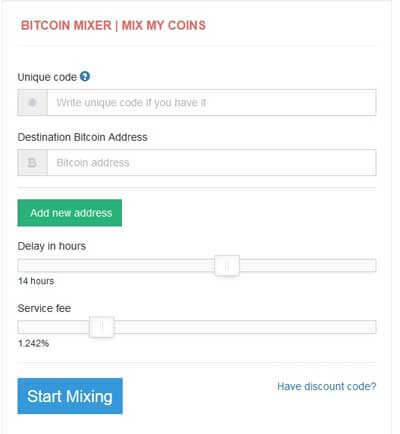 What Fee does BitMix charge for Mixing Bitcoins? Fee too is without doubt one of the most important factors when it comes to mixing Bitcoins. The lowest fee that BitMix accepts is 0.4% of the transaction which is pretty cheap even when compared to other mixers. And it also provides user-control over the fee so users get to manually increase the fee using the slider to a maximum of 4%. 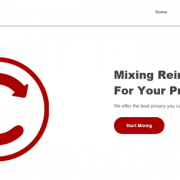 Changing the fee for each mix adds to the anonymity. So that’s me signing off this Bitmix review folks, I’ve covered the user-interface, fee, time-delays, distribution control, additional addresses and even logs policy. I suppose that’s everything that a Bitcoin mixer consists of, isn’t that right? After scooping up all the features, in my opinion BitMix slightly lacks in the number of additional addresses and user-control on time-delays and distribution control; but those issues aren’t major and can be accepted. The fee however is cheaper so overall it’s a mixer which does deserve a trial and based on the results it’s up to you folks to decide if you wish to stay, or switch to some other Bitcoin mixer. Either way, it’s all personal talk do let me know what you think of Bitmix as well as this Bitmix review in the comments down there.